There are two kinds of tourer, those who have had a puncture and those who will. Deflating your tyres helps to keep you in the ‘will’ category, but that’s not the only thing it achieves. Personally, my ride is rock-like when unhitched and one way to make it more palatable offroad is to deflate the tyres. I also dislike getting stuck in sand or worse, mud, so I drop my tyres as low as 15psi when facing such environments. Of course, that’s much too low to safely drive home on, so out comes the compressor once I’ve left my tracks. For the last six months, I’ve been using the TJM Portable Compressor. This unit is affordable; I’ve seen one on special for as little as $175, with typical pricing around $195. It’s light at 5.5kg, including the bag it comes with and its extras inside. 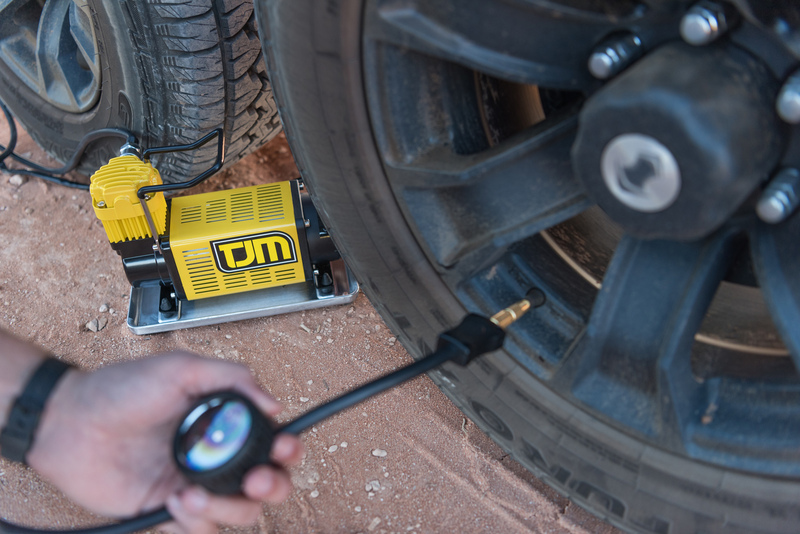 It’s robust, sitting on an alloy base plate with its air intake mounted high to avoid sucking in dust, plus rubber bushes between the body and the base plate to reduce vibration. This robust build helps give it its impressive five-year warranty. Using it is as simple as connecting the alligator clips to your battery, plugging in the 7.2m hose and flicking the switch on the body of the compressor. The hose has an inline gauge and the connections are hard-wearing brass with a favourite feature, a screw-on connection to the tyre valve. This means you can connect the hose, flick the switch and stand back up, only leaning back in to check the easy-to-read gauge. A few handy extras are included in the package, like a ball inflator and a pair of mattress adaptors to make light work of inflatable beds. 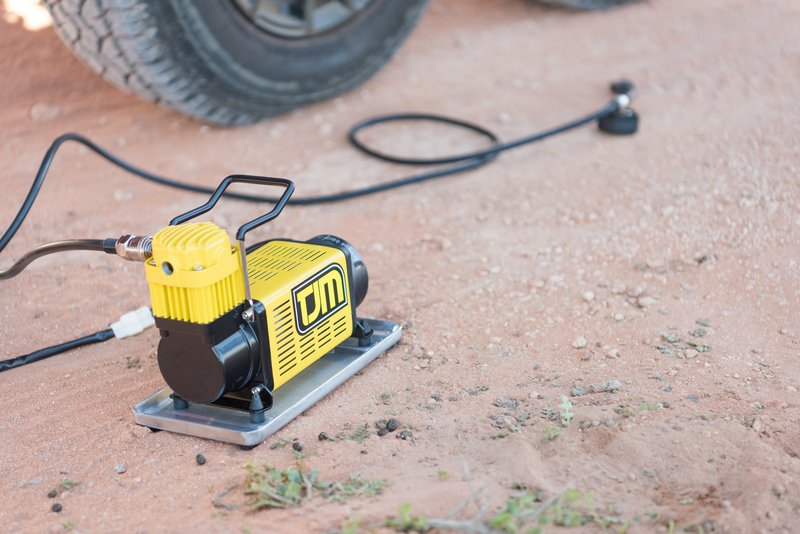 The TJM Portable Compressor has a claimed 72 litre per minute max airflow at zero psi and 43 litres per minute at 20psi, which is seriously high for a single pump and more than enough for most. 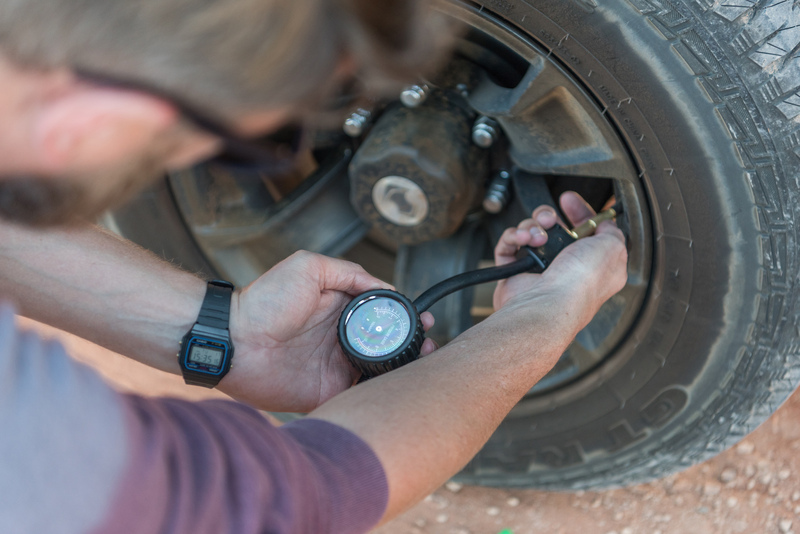 As it can draw up to 30amp, I suggest running your engine if you are inflating large tyres from flat or are inflating a high number of tyres, though in testing I had no issue with my engine off when bringing my 285/70 tyres up from 15 to 30psi. I suppose the biggest endorsement is that I’m not looking around the market for a compressor anymore!